If you are in a location in the Inland Empire prone to foundation shifts, you might encounter a slab leak. They can be very sneaky in early stages, so the best time to call in Pride Plumbing for a professional inspection is before you actually experience any signs! And if you are in a more advanced situation; no worries, we can handle that, too. If you have an unlicensed, inexperienced installer, he or she may cause the installed pipes to succumb to bends and dents over time. This often leads to leaks or even burst pipes. If water is jetting out of your sinks, your home’s water pressure may be too high, causing a slab leak. Pride Plumbing can test your water pressure if this is a concern and advise you on the next steps to correct it. Acidic water can contribute to very bad pipe damage. It’s a better idea to use PVC pipes rather than copper to reduce corrosion. We also offer 24 hour emergency service if there is any urgent leak. If you know or suspect you have another leak, we also have general leak detection services. Contact Us for Slab Leak Help! 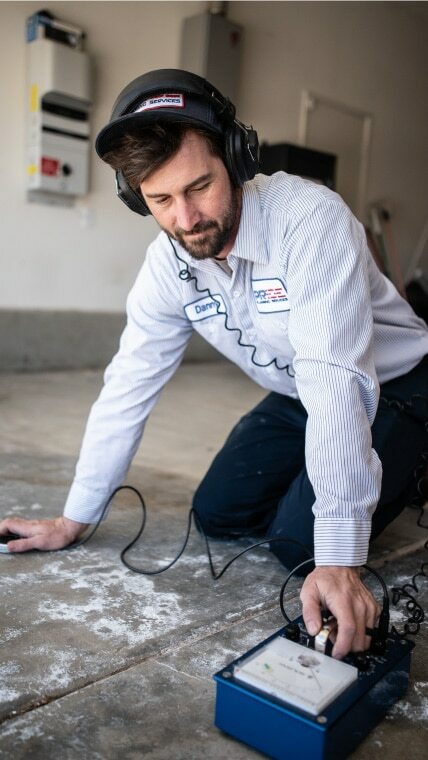 Reach us at (909) 372-1239 to test for a slab leak or to have any questions answered about the slab leak detection process or anything plumbing related. Our goal is to put your interests first by minimizing property damage and dealing with the situation quickly and professionally while making you feel like you are our only call. We take Pride in our expert services that combine expertise with genuine customer service.